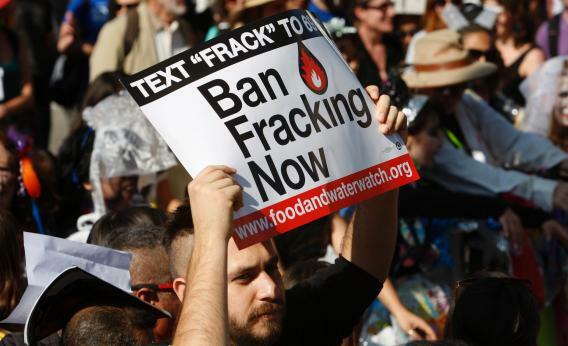 Fracking bans: Let politics, not science, decide. For more than four years, New York has had a moratorium on fracking, the controversial technique for extracting natural gas. New York Gov. Andrew Cuomo has long insisted that science, not politics, will dictate his decision about whether to lift the ban, and his administration has missed several self-imposed deadlines as they gather more scientific input. In fact, the State Assembly just approved a two-year extension of the moratorium until there is “conclusive scientific evidence” on environmental and health risks. Reportedly, this most recent delay stemmed from Robert F. Kennedy Jr., who convinced Cuomo to wait for results from an ongoing study in Pennsylvania. All of this goes to show that fracking, like most environmental controversies, is being treated as a scientific issue. This is understandable, because important questions surround the process of injecting millions of gallons of water laced with chemicals (some of them not publicly identified) deep into the earth to make natural gas embedded in shale formations accessible. What, for example, does this do to groundwater and air quality? But I actually think politics, not science, should dictate outcomes, because the larger questions at stake with fracking are about values: How much risk is acceptable? How do we weigh competing goods? What is the proper place of humans in nature? In short, what kind of world do we want to live in and pass down to our children? These questions are not reducible to science. There is no scientific way to determine an optimal distance between fracking sites and playgrounds. That decision depends on how we want to balance the goals of safety, community character, and access to mineral rights. I am not denying the importance of science or the need to protect its integrity, especially given how high the stakes are with fracking. Just imagine where we would be without Rachel Carson alerting us to the dangers of DDT. But science alone cannot do the work of making hard political choices. The “let science decide” framing transmogrifies a clash of worldviews into a proxy war about facts. The trouble is that there are plenty of facts to support both worldviews. Each side can legitimately claim to speak on behalf of the environment, because there are alternative ways of framing the issue. On one hand, natural gas is generally cleaner than the coal (think mountain top removal and mercury) that it is displacing at power plants. On the other hand, fracking may cause irreversible harm to watersheds. Natural gas has fewer CO2 emissions than coal, but then again before it is combusted natural gas itself (methane) is a far more potent greenhouse gas. On the Barnett Shale in north Texas, air pollution from drilling and fracking is a big concern. Opponents of the industry point to studies like the one conducted by Al Armendariz, a former EPA regional administrator, that concludes production of natural gas is a major contributor to harmful ozone. But the other side counters with their own numbers. They use a Texas Commission on Environmental Quality reply that showed ozone levels in the region decreasing just as natural gas production in the area increased four-fold. Opponents might then point to a study done in the Texas town of Dish that found high levels of carcinogens related to natural gas extraction. But industry advocates can respond with another study from Dish that concluded there was no public health problem. Then there are the findings that breast cancer rates are highest where there is the most fracking. But of course, there is another study that found no evidence of cancer clusters and no link between breast cancer and environmental pollutants. It can, and will, go on like this forever. Such persistent debates about the science of fracking are only echoes of deeper political fractures. No study—no matter how independent or rigorous—is going to settle the issue. Having been in the trenches in battles over fracking in my hometown of Denton, Texas, I can assure you that no one is going to change their mind or acquiesce to a policy that runs counter to their interests simply on the basis of science. The debate about the science of fracking is depressingly similar to a rancorous religious quarrel about theological doctrine. Science has not cured us of fundamental disputes—it has just provided a new way to manifest the old odium theologicum. The real question, then, is when to start playing politics with science. Should we do so before or after we have committed to fracking? If it is before action, we avoid harms but incur opportunity costs—take it from those New Yorkers who would like to start collecting royalties. If it is after action, we get the benefits but also the actual costs—take it from those who have seen a dozen pump trucks belching diesel fumes for weeks at a time near their kids’ schools. After all, it is not a matter of science to decide whose political (ab)use of science is best. Sandra Steingraber (who provided seed funding for New Yorkers Against Fracking and has been hailed by the Sierra Club as “the new Rachel Carson”) and other environmentalists seeking a permanent ban in New York say that “the right time to study fracking is before fracking begins.” They might say the same about wind farms. But wind farms fit better into their ideal about what kind of world we should build, so they will quickly believe that science has conferred its blessing on any proposed wind project. Fracking, on the other hand, could never be studied enough to make them accept it. I happen to share that perspective. I believe that going to such extremes to prolong our addiction to fossil fuels is a grave mistake. My perspective is partly based on scientific evidence. But it is mostly grounded in a moral conviction that humans should live more lightly on the planet and that we would be happier if we were not such slaves to the desires and institutionalized needs that drive our gluttonous energy consumption. This is where I part ways with most environmentalists, because I believe wind farms are just more of the same problem. There is no scientific answer to the question of how much science to do. That will depend on your worldview or your interests in relation to the technology at issue. I suspect that the closer you live to a proposed gas well, the more likely you are to call for more research. From a scientific point of view, this is arbitrary and biased. But I don’t have a problem with it. Then again, I’m not trying to pretend this isn’t all about politics.